According to expert Erich Hoyt, the key elements of high quality, sustainable whale watching anywhere in the world are: “(1) good, long-term financial management, (2) scientific input and output, (3) attention to conservation, (4) investment in people (local and visiting) with good customer care and community relations, (5) educational input and output, (6) enhancement of benefits, and (7) reduction of costs. Benefits and costs (including social, ecological, and financial aspects) can be evaluated using a cost-benefit analysis”1. Development of an industry that includes all of these elements is best achieved through a collaborative approach that involves all the relevant stakeholders, and undergoes regular review and assessment to determine whether management measures need to be adapted in response to any changes in the level of pressure on the target whale or dolphin populations or changes in the animals’ behaviour, distribution, or population numbers. 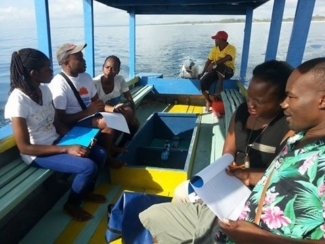 A marine conservation NGO works in close collaboration with the government to conduct research and monitoring of dolphin watching activities in Kenya. Photo courtesy of Watamu Marine Association. These can include fishermen taking tourists out on a part time basis, dive operators, charter fishing boat operators or marine naturalists, and will usually involve businesses of 5 or fewer part- or full time staff and small vessels (e.g. maximum 20 passengers). Offering tours, marketing tours, participating in training and capacity building workshops; collaborating with researchers by hosting researchers on board and/or contributing sightings/photo data; contributing to the local community by employing locals, boosting local support businesses. Cruise ship companies that operate live-aboard cruises that may incorporate whale watching (e.g. in Alaska, the Caribbean or the Antarctic). Hotels and resorts where whale watching customers stay, restaurants and snack shops near embarkation points, transportation services to and from the whale watching location (e.g. ferries, charter airlines), boat maintenance providers, souvenir shops and artisans supplying those shops, etc. Providing accommodation, food and services to whale watch tourists and operators, and benefitting from additional business generated by whale watching in the community. Raising awareness of whales and dolphins and their conservation needs by promoting whale and dolphin-related products with locals and visitors. Collaborating with other stakeholders to devise a management strategy; ensuring that strategies have the legal backing to be effective; working with law enforcement agencies and other stakeholders to ensure effective monitoring and collaboration. Patrolling the areas where whale watching is conducted to monitor compliance with regulations designed to protect tourists and whales and dolphins. Local resident stakeholder groups, national or international (whale and dolphin) conservation NGOs/associations/charities; Tour operators’ associations; dive clubs, etc. Representing the interests of the local community and environment, as well as the whales and dolphins, to ensure that whale watching activities do not have a negative impact on the community and local natural resources. Wildlife biologists, ecologists, oceanographers; These can be associated with academic institutions like universities, or NGOs. In the early phases of development, researchers can help to conduct baseline surveys on the target whale/dolphin populations, and an environmental impact assessment of whale watching activities. Once the industry is established, they can assist local government and other stakeholders with the continual monitoring of potential impact on target whale or dolphin populations. Economists and social scientists studying tourism and communities. These can be associated with academic institutions like universities, or NGOs. Erich Hoyt and many others strongly encourage the involvement of all these stakeholders (or at least representatives from each of these stakeholder categories) in all aspects of planning and management of a whale watching industry, which are presented in a 14-step plan in the Blueprint for Dolphin and Whale and Watching Development1. This multi-stakeholder collaborative approach was also endorsed during several workshops, including those hosted by the IWC in 20102 and 20133. Collaboration can be fostered and structured through regular meetings (e.g. at the start and/or end of each whale watching or peak tourist season), capacity building workshops or special events like whale festivals1. In addition to participating in the initial design and development of a whale watching industry, all of these stakeholders have a role to play in the adaptive management of the industry over time. Adaptive management is essential in order to take into account changes in the environment, tourism numbers, operator behaviour, or the target whale or dolphin population4-7. A concept that can be helpful in this process is the establishment of Limits of Acceptable Change (LAC)7, where stakeholders collectively decide on measurable limits that would require a change in regulations or management strategies. These limits can be established for biological parameters (e.g. any decline in population numbers, shift in distribution of animals, noticeable health impacts, etc), or socio-economic factors (e.g. exceeded threshold of annual visitor numbers, frequency of infractions of whale watching codes of conduct). The table below summarizes some of the potential costs and impacts or changes that could signal a need to adapt the current management regime, and actions that could be taken to mitigate these costs (see also the section on management strategies and tools for a more detailed description of how these work and which case studies illustrate the use of different tools). Ensure that operators are adhering to the best environmental practices with regard to engine maintenance, waste disposal, recycling, etc. E.g. the cumulative impacts of repeated disturbance of the target animals’ critical functions such as resting, feeding and socializing. These can be difficult to measure and require expertise from researchers. Managers may decide to use a precautionary principal if there is even suspicion that a limit of acceptable change has been reached, rather than waiting for measurable proof that a population is declining, or behaviours and energy budgets are significantly impacted. Establish the ‘limits of acceptable change’ for the target area and how these will be measured or defined: for example- how many vessels/tours per day lead to a risk of negative impact on the population? Limit the number of vessel licenses, and review this often based on observed pressures. Establish approach guidelines to limit the distance, speed, and number of vessels that can approach a single (group of) whale(s) or dolphin(s). Create protected areas or implement time-area closures to prevent interactions with animals in critical habitats and/or define areas where stricter management measures can be enforced. Local communities may begin to feel ‘overrun’ by tourists, especially if tourism conflicts with local fishing or other marine activities, or strains community services originally designed for local residents only. Whale watching operators begin to engage in competition or confrontation among themselves, or come into conflict with other marine users. Establish limits of acceptable change from a social standpoint and actively manage growth, so that it does not negatively impact the local community or its infrastructure. Include local residents/stakeholders in annual/semi-annual reviews of the industry and its impacts. Ensure that enough resources are directed toward local resident services. Find ways to involve the local community in conservation activities. While whale watching can generate income for local communities, it also generates costs – such as the creation of additional infrastructure (roads, clinics, hotels, harbours etc) to accommodate the industry and influx of tourists. It may conflict with fishing, and require increased investment in administration and management (e.g. monitoring and enforcement). The table above can be used as a very simple guide to conducting cost-benefit analyses on a regular basis. The frequency of reviews could range from yearly to once every five years, depending on how rapidly the industry is developing in a certain area and how closely it is being monitored7. More detailed models to conduct these types of analyses and adaptive management reviews are available in very good articles on management of whale watching by Higham et al. 20095 and Lundquist 20147. A whale watching vessel in Madeira. Photo courtesy of Fabian Ritter, MEER. Is the wildlife resource degraded or in the process of degrading? Is population growth (number of births minus number of deaths) stable or positive? Are animals leaving the area? Are animals being approached or watched closely causing them to change their behaviour, even in subtle ways? Do animals show any signs of possibly whale watch or stress related disease or injury? Is the overall environment degraded? Is the water visibly polluted? Has it been tested for contaminants? Is waste management from coastal facilities and tour vessels adequate to prevent pollution? Are the visitors local, domestic or international? Do tourists express a desire to help protect and conserve dolphins? Are tourist numbers (and subsequently the number of tours on the water with animals) increasing, decreasing, or remaining stable? Are they knowledgeable about marine mammals, the environment and local culture? Are they personable and good teachers? Do they have a sense of responsibility toward the activities of visitors in their ‘care’? Are business practices compatible with sustainable tourism? Does wildlife watching contribute to the community? Case studies on this site that provide highlight models of stakeholder engagement include those from the Dominican Republic, Patagonia (Argentina), the Whale Trail (Pacific coast of the USA and Canda) and Loreto Bay (Mexico). Case studies that highlight adaptive management include those from Kaikoura (New Zealand), Patagonia (Argentina) and the Samadai Reef (Egypt).The Praia do Forte case study (Brazil) contains a concrete example of how an area can start to work toward determining the carrying capacity of a whale watching site9. IWC. Report of the International Whaling Commission Workshop on Whale Watching. 1-27 (International Whaling Commission, Patagonia, 2010). IWC. Report of the International Whaling Commission Whale Watch Operators Workshop. 1-20 (International Whaling Commission, Brisbane, 2013). 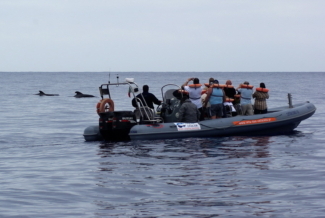 Hoyt, E. Sustainable ecotouris on Atlantic islands, with special reference to whale watching, marine protected areas and sanctuaries for cetaceans. Biology and Environment: Proceedings of the Royal Irish Academy 105B, 141-154 (2005). Fernandes, L. and M.R. Rossi-Santos, An Integrated Framework to Assess the Carrying Capacity of Humpback Whale-Watching Tourism in Praia do Forte, Northeastern Brazil, in Advances in Marine Vertebrate Research in Latin America: Technological Innovation and Conservation, M.R. Rossi-Santos and C.W. Finkl, Editors. 2018, Springer International Publishing: Cham. p. 41-73.